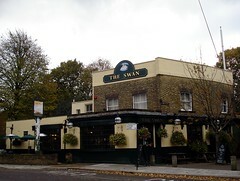 Pub near Chiswick Park Station. It's a little bit gloomy inside, but has a rather nice beer garden out the back, with space heaters, decking, flagstones, a lawn, lots of trees, and plenty of seating. There are some sofas inside too, in the back room. They have three or four handpumps on the bar, and they also have an impressive-looking (real) coffee machine, as in the kind that requires a barista to operate. As of November 2008, food is served 6pm-10pm Mon-Thu, 6pm-10:30pm Fri-Sat, and 12:30pm-4pm and 6pm-10pm Sun; Kake thinks there's also food on Saturday lunchtimes but not weekday lunchtimes. Kake has visited a couple of times now. On my May 2008 visit, beers available were Harveys Sussex Best (£1.50/half) and Black Sheep. Piped music was playing - I think it was Stephane Grappelli. Unfortunately my Sussex Best was rather cloudy, and had a couple of small bits of debris in. It was just after opening time though. They did pull through a pint or two into a jug before serving me. On my second visit, on a Sunday lunchtime in November 2008, the beers were London Pride, Harveys Sussex Best, and Wychwood Hobgoblin, and they also had a list of potential future beers on the bar for customers to vote on. I was there for brunch, however, so I had a cup of tea (£1.50, with a choice of Earl Grey, English breakfast, and a handful of fruit/herb infusions) and some wild mushrooms on toast (£7.50), which came with rocket and parmesan on the side and a soft-boiled egg on top photo. This wasn't bad, though the mushrooms were a little lacking in flavour and I would have preferred it if the egg hadn't been cold. I also thought the price was a little high, though it did include some (good, generously-sized, but unnecessary) chunks of warm granary bread, brought with olive oil for dipping while I was waiting for my actual food. I'd certainly give the food here another chance, though, if I was in the area. Other options I noted down from the menu (which I believe changes often) included conchiglie with cavolo nero, ricotta, and pine nuts (£7/£9.50), roast fillets of mackerel with new potato and fennel salad and mustard vinaigrette (£12), cannellini bean and roast garlic soup with rosemary and truffle oil (£5), panfried calf's liver with puy lentils, swiss chard, creme fraiche, and balsamic vinegar (£14), and pheasant and porcini risotto with chestnuts and sage (£7.50/£10). Service was very friendly, too. It's worth noting that this place seems to be very popular on a Sunday; there were actually people queueing up outside the door before it opened at noon, and it filled up very quickly. A thick stack of Sunday papers was available for customers, including the Observer and the Sunday Times. Derek had sausages and mash for dinner here one evening in early 2008, for £9.50, I believe. It was quite tasty, sufficiently filling, and came with an appetizer of bread, oil, salt and pepper. There was Black Sheep and London Pride on the handpumps. Last visited by Kake, 2 November 2008. Food times taken from signs on that visit. Opening hours taken from Time Out website, April 2008. Last edited 2013-05-10 08:07:26 (version 14; diff). List all versions. Page last edited 2013-05-10 08:07:26 (version 14).